Over the years, I’ve inherited a number of antiques. A mantel clock with wood workings. An English Delft charger with a small hairline fracture. And a set of 18th-century Windsor chairs. 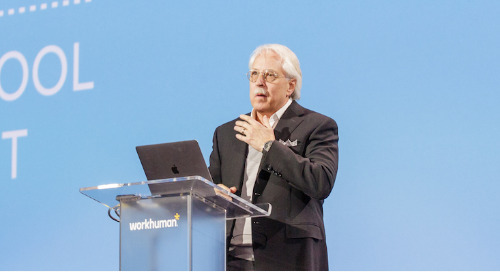 So when I first read the title of Merck’s Workhuman 2019 breakout session – “Antiquated to ‘Gold Standard’: 3 Steps to Modernize Employee Recognition” – I was intrigued, albeit a bit confused. What exactly is an antiquated recognition program? But then the Merck team described their previous awards program … Paper-based. Long lead times. No peer-to-peer. Outdated service anniversaries. Okay, I was convinced. “Antiquated” it was. Then began the exciting story of how Merck took their horse-and-buggy rewards program and transformed it into a finely tuned Ferrari. Dave Watson, global HR portal lead & global solutions lead: compensation & benefits, shared the vision for Merck’s new recognition program – to create a culture of recognition and engagement by empowering all employees to recognize others. They envisioned a program that would acknowledge and celebrate employees with an approach to recognition that was consistent, simple, and meaningful. According to Dave, the process began with finding and teaming with a truly world-class recognition partner. One who could provide out-of-the-box thinking and offer employee-friendly, best-in-class tools. A partner who listened to what Merck was trying to achieve. That partner was Workhuman. Dave noted, “Workhuman asked us what we were trying to accomplish. They listened to us and helped us manage change.” Among those goals was the need for employees to receive recognition quickly – to create a moment of gratitude that had an immediate and meaningful impact, and was connected to company values. "Workhuman asked us what we were trying to accomplish. They listened to us and helped us manage change." As a vast, international company, Merck was looking for a program that could deliver a consistent and relevant recognition experience on a global scale and meet the challenges of different cultural orientations and traditions. And they wanted a solution that could improve the visibility, tracking, and administration of recognition. “Full scale.” That’s how Michaela Leo, director of compensation programs and analytics, described their approach to launching INSPIRE, the name of Merck’s new recognition program. They believed that to have a meaningful impact on company culture, INSPIRE had to reach as many employees as possible. To make that happen, they focused on adoption during launch and enlisted and dispatched more than 400 “ambassadors” throughout the organization. Ambassadors are employees from all areas of the company – not necessarily HR – who are well-versed in the workings and goals of the program, and could effectively evangelize INSPIRE throughout the organization. The results? By the end of the first year, INSPIRE saw an astounding 359,000 recognition moments, and 84,00 mobile recognition actions. Seventy-two percent of these moments were peer-to-peer, and in all 85 countries where Merck has a presence, 100% of all employees were recognized. By the end of the first year, INSPIRE saw an astounding 359,000 recognition moments. In addition, 72% of awards were peer-to-peer, aligning with one of Merck’s key goals for their program. The high mobile usage reflects – in their view – the needs of the modern workplace as their employees embrace the convenience of giving and approving recognition on the go. What has been the business impact of INSPIRE? According to Nick Vollrath, executive director, global compensation, they wanted to determine if the new recognition program was achieving the business and workforce outcomes they were hoping for. One way to get a read on INSPIRE’s effectiveness was through their employee voice survey. Among its findings, recognition was the single highest measured item on the entire survey. Nick asked the question, “As the workforce evolves, how do we adapt?”. He talked about the critical role of INSPIRE as Merck engages a rapidly changing, global workforce. He believes it enables Merck to establish points of impact across a geographically and culturally diverse workforce – while staying within local rules and regulations. With the INSPIRE program in place, they can easily calibrate budgets to meets the needs of the program, and to boost its effectiveness in areas where participation has lagged. In order to maintain the “gold standard” in recognition, Nick looks forward to leveraging a deep partnership between Merck’s HR Analytics and the Workhuman Research & Analytics Institute (WARI). How will Merck keep the momentum of their successful recognition launch going forward? Nick cited the importance of teaming up with communications to drive engagement, reminding employees to thank those who have helped throughout the year and targeting communication to managers with tips on maximizing the program. In addition, they’ll continue to refine the program based on feedback from employees – combined with a ramped-up education program for managers to help them maximize the program. Each panel member was asked to share a final thought on their journey from antiquated rewards to a “gold standard” social recognition program. Sure, there’s a certain charm and emotion attached to those family heirlooms and antiques we cherish. But when it comes to social recognition programs, a modern “gold standard” program – like Merck’s INSPIRE – is clearly the way to go.